Irina Slav : What could push oil to $100? 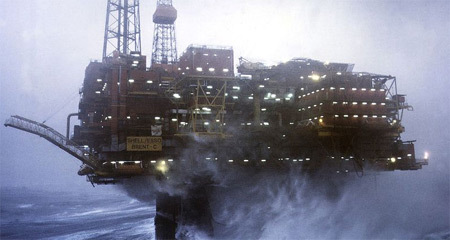 Shell/Esso Brent Charlie platform oil rig on the North Sea. If anyone thought the latest oil market outlooks of the EIA and the IEA are upbeat, here's an even more upbeat one from Energy Aspects: The consultancy expects crude demand this year to grow by 1.7 million bpd, and says Brent could touch above $100 a barrel in 2019. According to Energy Aspects, the reason for the further jump in prices will be a drop in new production outside the U.S. shale patch. It's a little hard to buy that, however, if one remembers that there is 1.8 million bpd in production capacity ready to be tapped again once OEPC and Russia taper their production cuts. That alone should take care of the demand growth that the consultancy predicts for this year. That is, unless it booms by 2 million bpd, which is the top of the range forecast by Energy Aspects. But even then, the U.S. and Russia alone could take care of it: The Russian state majors are itching to expand production in eastern Siberia. Of course, the likelihood of OPEC and Russia bringing all that production online is highly debatable, as the partners in the cut deal seem still determined to continue with the original plan. Nevertheless, the barrels are there, so there's no urgent need for actual new production yet. However, if global demand grows so much so quickly, does anyone have any doubts that the new, expanded oil cartel will be flexible enough to make the best of the situation? Hardly. So how likely is this demand growth? According to Energy Aspects, there is currently "no real drag on demand growth." The global economy is in growth mode, which lends strong support to the price momentum, and the short-term forecasts for the top consumers of crude oil are all bullish. Yet, there's one potential drag: prices. Here's what Bloomberg Gadfly's Julian Lee says : "Rising prices can have a chilling effect on demand growth, and benchmark crude prices have risen more than 55 percent since their rally started in June. End-user retail prices are feeling this." But that's not all. While Lee acknowledges that higher prices at the pump will affect demand in Europe and North America, the effect of more expensive fuels will be much more palpable in developing nations, which are the main drivers of global growth, after all. There, Lee notes, governments used the oil price slump to reduce fuel subsidies, and now that prices have started climbing up again, the end-user price jump will be much higher. This will inevitably interfere with economic activity, potentially undermining that growth everyone is talking about. And then there's gas — the bridge fuel, the alternative. Both countries and oil majors are investing a large percentage of total capex in natural gas production and infrastructure, with China as the best example. Gas is cheap, the market is oversupplied and unlikely to swing into a deficit anytime soon, given the number of large-scale LNG projects in Australia coming online. True gas-fueled cars are few, and car fuels account for the biggest portion of oil demand. But higher prices are higher prices. Too high, and people start using public transport if it's available. But let's forget about prices at the pump and the switch from oil to gas. Let's talk about that economic growth that the IMF forecast in its latest World Economic Outlook and that so many consultancies are also predicting. There are voices being heard — including from the IMF itself — that the next recession is not far away. In fact, according to some, such as Forbes' Michael Lynch, a recession is pretty close by. Lynch uses an indicator he calls "more money than brains" to anticipate recessions. Describing it as "conspicuously ridiculous consumption", he exemplifies it with the current fad of raw water. He also notes that the U.S. stock market is at historic highs. It is time for a correction, Lynch says, and he is not the only one. With a correction in stock markets and a slowdown in the economy of the world's largest consumer, what are the chances of Brent hitting $100 a barrel? Slim. Editor's Note: This commentary was originally published by Oilprice.com, 01/24/2018. Petroleumworld reprint this article in association with Oil Price.com.